Revision rhinoplasty, commonly referred to as secondary rhinoplasty or revision nose surgery, is used to address unwanted results following a primary nose job. In some instances, revision rhinoplasty is performed to repair aesthetic and/or functional problems of the nose that arise following initial rhinoplasty surgery. Or, revision rhinoplasty is used to correct the shortcomings of a prior rhinoplasty procedure. If a patient undergoes rhinoplasty surgery and is not satisfied with the results, revision rhinoplasty performed by an expert facial plastic and reconstructive surgeon is ideal. Thanks to revision rhinoplasty, a patient can correct problems that were not addressed in a primary rhinoplasty. Dr. Babak Azizzadeh is a leading Los Angeles facial plastic and reconstructive surgeon with many years of revision rhinoplasty experience. He is Harvard-trained in aesthetic and reconstructive revision rhinoplasty surgery and offers comprehensive revision rhinoplasty support at the CENTER for Advanced Facial Plastic Surgery in Beverly Hills. 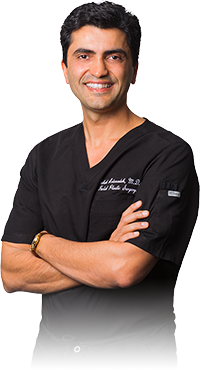 In addition, Dr. Azizzadeh has written “Master Techniques in Rhinoplasty,” “Beverly Hills Beauty Secrets” and other bestselling facial plastic surgery books. He also has been recognized as a “Top Doctor” by US News and World Report for his proficiency in revision rhinoplasty procedures. What should an individual expect before and after revision rhinoplasty in Beverly Hills, Los Angeles? Check out our revision rhinoplasty before and after photo gallery to see how our patients have improved their facial appearance thanks to the support provided by Dr. Azizzadeh, a world-renowned revision rhinoplasty specialist. Revision rhinoplasty enables an individual to reshape the nose and enhance his or her cosmetic appearance after a previous rhinoplasty procedure failed to deliver optimal results. Also, this facial plastic surgery allows a patient to restore the nasal function if it was impaired during a previous rhinoplasty. Dr. Azizzadeh of the CENTER for Advanced Facial Plastic Surgery in Beverly Hills understands the intricacies of revision rhinoplasty surgery. Ultimately, revision rhinoplasty is one of the most complex facial plastic surgery procedures, one that must be completed by an experienced and knowledgeable facial plastic surgeon. Dr. Azizzadeh possesses extensive revision rhinoplasty expertise and will devote the necessary time and resources to help a patient accomplish his or her desired revision nose job goals. He will precisely correct the delicate structures of the nose during revision rhinoplasty, and as such, ensure a patient receives extensive support before, during and after the rhinoplasty surgery. Rejuvenated Facial Appearance: Revision rhinoplasty is used to reshape the nose, resulting in a more youthful and balanced facial appearance. Improved Breathing: Revision rhinoplasty is sometimes performed in combination with nasal obstruction surgery or a septoplasty to correct nasal obstructions that occur due to a prior nose surgery. Enhanced Facial Symmetry: Revision rhinoplasty is used to correct a bulbous nasal tip, crooked nose, and other facial problems, leading to improved facial symmetry. Increased Self-Confidence: Revision rhinoplasty revitalizes the appearance and shape of the nose, and as such, often provides a confidence-booster for patients who are self-conscious about their facial appearance. During an initial consultation, Dr. Azizzadeh teaches patients about revision rhinoplasty, how the surgery is performed, and its benefits. Dr. Azizzadeh allocates time and resources to ensure patients understand all aspects of revision rhinoplasty and can make informed treatment decisions. How Does a Primary Rhinoplasty Differ from a Revision Rhinoplasty? Primary rhinoplasty surgery is one of the most-popular facial plastic surgeries. It is used to reshape the nose to improve the facial aesthetic. Or, primary nose surgery is used to treat a deviated septum, breathing problems, or other structural defects of the nose and restore the nasal function. Comparatively, revision rhinoplasty is performed after a primary nose surgery fails to deliver the desired results. A revision nose job is similar to a primary rhinoplasty because it is used to address the facial aesthetic or correct structural problems associated with the nose. However, a revision rhinoplasty procedure is performed if an initial nose job does not help a patient achieve his or her treatment goals. Revision rhinoplasty often takes longer to perform than a traditional rhinoplasty procedure too. Revision rhinoplasty is more complex than primary rhinoplasty. A revision rhinoplasty procedure requires a facial plastic and reconstructive surgeon who possesses a deep understanding of the nasal structure and advanced surgical techniques. Also, a revision rhinoplasty surgery should be performed by a facial plastic surgery expert who provides each patient with a personalized treatment plan. Dr. Azizzadeh consistently ranks as one of the top revision rhinoplasty surgeons in California, thanks in part to his commitment to patient education. Dr. Azizzadeh is happy to explain the similarities and differences between revision rhinoplasty and primary nose job surgery. That way, Dr. Azizzadeh helps patients determine whether a revision nose job is the right treatment to help them achieve their facial plastic surgery goals. What Are Dr. Azizzadeh's Revision Rhinoplasty Qualifications? When it comes to revision rhinoplasty surgery, you should only trust your nose to an experienced Los Angeles-based facial plastic surgeon like Dr. Azizzadeh. Because Dr. Azizzadeh is double board-certified in facial plastic and reconstructive surgery and otolaryngology (head and neck surgery), he possesses an unparalleled in-depth knowledge of the underlying structures in the face and head that he applies to his revision rhinoplasty surgical techniques. Furthermore, Dr. Azizzadeh will perform a revision nose job carefully and precisely, ensuring a patient can maintain the integrity of the nasal function as well as improve his or her facial appearance. He offers patients the skills and years of experience needed to deliver superior revision rhinoplasty results time and time again. If a patient is unhappy with the cosmetic results of a nose job, revision rhinoplasty may provide this individual with a second chance to achieve his or her ideal facial appearance. Moreover, if a past rhinoplasty damaged the nasal function, revision rhinoplasty offers a great opportunity to repair this issue. Dr. Azizzadeh understands what it takes to reconstruct the nose and restore the nasal function and always find this procedure very rewarding for the patients. What Should You Expect During a Revision Rhinoplasty Consultation? Finding a revision rhinoplasty surgeon who is honest and forthright is paramount. A revision nose job can be complicated and may not provide the patient with the exact results they envision if performed by an unqualified surgeon. But if a patient works with a skilled, experienced facial plastic surgeon, like Dr. Azizzadeh, he or she is will receive the support needed to make an informed revision rhinoplasty decision. Dr. Azizzadeh strives to offer his patients a very comprehensive and dedicated revision rhinoplasty consultation. This meeting allows Dr. Azizzadeh to learn about each patient and address his or her revision nose surgery concerns. The consultation is mutually beneficial and enables Dr. Azizzadeh to understand a patient’s revision rhinoplasty goals and outline the steps an individual will need to take to accomplish these aspirations. Plus, Dr. Azizzadeh will dedicate sufficient time and resources to respond to a patient’s revision nose job queries and guarantees the individual will feel 100% comfortable with revision rhinoplasty by the end of the consultation. Revision rhinoplasty should allow an individual to achieve balance between the bridge, nostrils and tip of the nose. During the consultation process, Dr. Azizzadeh will evaluate these factors in conjunction with an individual’s cheeks, chin, eyebrows, forehead and lips. By doing so, Dr. Azizzadeh can collaborate with a patient to find the best way to provide him or her with a natural-looking and functional nose. Dr. Azizzadeh recommends a patient bring his or her medical records to their consultation. This information will enable Dr. Azizzadeh to understand an individual’s medical background and offer custom revision rhinoplasty recommendations. How Does Dr. Azizzadeh Use 3D Imaging During the Consultation Process? The Vectra 3D imaging system allows Dr. Azizzadeh to take 3D photographs of a patient’s face and use these images to understand how an individual will look before and after revision rhinoplasty. With the Vectra system, Dr. Azizzadeh can capture all angles of an individual’s face. Then, he will be able to display images that highlight the expected outcome of revision rhinoplasty, enabling a patient to better understand how the procedure will impact his or her facial appearance. As a Harvard-trained, double board-certified facial plastic and reconstructive surgeon, Dr. Azizzadeh takes an extremely detailed approach to revision rhinoplasty. Through his many years of experience, he believes there is no such thing as a standard revision nose surgery because every patient requires thorough consideration and examination of his or her unique circumstances. Dr. Azizzadeh carefully takes note of each individual issue in the nose, as well as how it interacts with other facial features. His approach is dynamic, integrating every area of his expertise for the best outcome. Revision nose surgery is an incredibly complex procedure and requires an expert to deliver quality results. Dr. Azizzadeh prides himself in providing his patients with very honest and realistic expectations for their revision rhinoplasty results. As a leading expert in in the area, Dr. Azizzadeh has worked with many patients who were initially promised unrealistic results, leaving these patients with a nose that they had not anticipated and desiring a revision rhinoplasty surgery. You can trust that Dr. Azizzadeh will always have your best interests in mind, and provide you with his honest expert opinion on what is best and realistic for you. What is a natural looking revision rhinoplasty? The key aspect to a natural looking revision rhinoplasty is really your anatomy. Dr. Azizzadeh believes ethnicity and gender play an important role to create a nose that really fits your face. It’s not about creating a nose that’s perfect, but creating a nose that’s perfect for your face. Dr. Azizzadeh thoroughly examines your bone structure, lips, chin, neck, and the under eyes as each of these components needs to be in balance with the nose. Ultimately, he wants your eyes to be the focus of your face. When someone looks at you and their focus naturally goes to your eyes, that is the result of a natural revision rhinoplasty outcome. The key aspect is a nose that it creates the perfect balance between all features. As a top-rated revision rhinoplasty surgeon in Los Angeles, Dr. Azizzadeh strives to help each secondary nose job patient achieve a natural-looking nose. 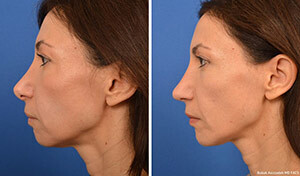 Dr. Azizzadeh learns about a revision rhinoplasty patient and creates a custom treatment plan. He then works with a revision rhinoplasty patient to deliver the optimal results. Dr. Azizzadeh offers instructions at the pre-operative appointment to help a revision rhinoplasty patient prepare for treatment. He helps a patient plan for the night before and morning of a revision rhinoplasty in Los Angeles. Dr. Azizzadeh also provides instructions for postoperative revision rhinoplasty care. Some medications may cause a revision rhinoplasty patient to bleed more than normal during treatment. Therefore, Dr. Azizzadeh sometimes recommends revision rhinoplasty patients stop taking certain medications a few weeks before surgery. Clean your incisions with hydrogen peroxide once a day and use antibiotic salves on incisions twice a day. Use cold compresses for the first three days following surgery and then switch to a warm compress on bruises. Strenuous exercise can be resumed three to four weeks after surgery to minimize post surgical complications. You must receive clearance from Dr. Azizzadeh before resuming your workouts. Dr. Azizzadeh wants a revision rhinoplasty patient to know what to expect following his or her procedure. He details the revision rhinoplasty treatment process to help a patient establish a realistic recovery timeline. At The CENTER for Advanced Facial Plastic Surgery in Beverly Hills, our goal is your comfortable, smooth recovery. If any questions or concerns arise at any point during your revision rhinoplasty recovery, we are at your disposal. Please call or email us with any questions and we will help with anything you need. What Does Revision Rhinoplasty Recovery Involve? Revision rhinoplasty is an outpatient procedure with a recovery period of one to two weeks. A patient may need to stay home from work for seven to 10 days after surgery, depending on the amount of bruising and swelling. The patient will have a splint on the nose, which will be removed one week later. Most patients will not have nasal packing after a revision rhinoplasty. It also is important to note that revision rhinoplasty requires a long-term commitment and routine follow ups are critical components of your nose surgery. Since full results will appear within one to two years after surgery once all of the internal swelling has dissipated, Dr. Azizzadeh will continue to consult with a patient to ensure an individual’s progress remains on track. The patient will then be seen every 3 months for the first year and annually after that. As an expert Los Angeles-based revision rhinoplasty surgeon dedicated to patient care, Dr. Azizzadeh stays in touch with a patient throughout the recovery cycle. Dr. Azizzadeh provides a revision rhinoplasty patient with insights into all aspects of surgery and responds to his or her concerns or questions. Why Do Patients Choose Dr. Azizzadeh for Revision Rhinoplasty in Los Angeles? If an initial nose job results in breathing difficulties or cosmetic problems, revision rhinoplasty is necessary to correct such issues. With Dr. Azizzadeh at his or her side, a patient can take solace in the fact that he or she is working with an expert Beverly Hills revision rhinoplasty surgeon. Dr. Azizzadeh understands the challenges associated with traditional and revision rhinoplasty procedures. Yet Dr. Azizzadeh’s goal is the same for all rhinoplasty procedures: to ensure a patient can enjoy a functional nose and a balanced, natural-looking facial appearance. To accomplish this goal, Dr. Azizzadeh creates a custom revision rhinoplasty treatment plan. When it comes to finding a top revision rhinoplasty surgeon in California, patients often choose Dr. Azizzadeh. To date, Dr. Azizzadeh has performed facial rejuvenation procedures for international dignitaries, celebrities and even other physicians. Dr. Azizzadeh also personalizes each facial rejuvenation treatment plan to his patient, ensuring he or she can achieve the best-possible results. Can you fix a bad nose job? Revision rhinoplasty helps an individual correct the results of a bad nose job. It may be performed for cosmetic or medical reasons, and studies indicate revision rhinoplasty is performed after approximately 5 percent to 15 percent of nose jobs. How successful is a revision rhinoplasty procedure? Like any surgery, a revision rhinoplasty offers no guarantees. However, revision rhinoplasty performed by an expert facial plastic and reconstructive surgeon like Dr. Azizzadeh can be successful. Dr. Azizzadeh tailors a revision nose job to his patient, ensuring this individual can achieve his or her desired results. Plus, Dr. Azizzadeh offers comprehensive assistance following a revision rhinoplasty to guarantee a patient’s recovery stays on course. How can I tell if I need a revision rhinoplasty? Revision rhinoplasty may be ideal for individuals who are dealing with cosmetic or functional issues after nose surgery. In some instances, patients request revision rhinoplasty to create facial harmony following a failed nose job. Or, in other instances, patients undergo revision rhinoplasty surgery to treat functional nasal issues that occur after a nose job. Are there age requirements to undergo a revision rhinoplasty procedure? Dr. Azizzadeh does not generally recommend nose surgery until an individual’s nose has fully grown. This typically occurs as early as 15 or 16 years old for girls and 16 or 17 years old for boys. To determine if an individual is eligible for revision rhinoplasty surgery, Dr. Azizzadeh meets with him or her and performs an evaluation. If Dr. Azizzadeh believes a secondary nose surgery can help a patient correct mistakes from a past nose job, he will perform a revision rhinoplasty. Why do nose jobs fail? A failed nose job is a devastating experience for both a patient and facial plastic and reconstructive surgeon. For a patient, a failed nose job delivers unwanted treatment results. Meanwhile, for a facial plastic and reconstructive surgeon, a failed nose job represents a missed opportunity to help a patient achieve a nose that matches his or her facial features. Dr. Azizzadeh strives to help a patient make an informed treatment decision. As such, he educates patients about revision rhinoplasty, its benefits and its potential complications prior to treatment. Dr. Azizzadeh also crafts a custom treatment plan designed to help a patient minimize the risk of complications. With this plan in place, Dr. Azizzadeh and a patient can work together to achieve the optimal revision nose surgery results. Can any plastic surgeon perform a rhinoplasty revision? Revision rhinoplasty is a highly specialized procedure. Therefore, it is important to work with a facial plastic and reconstructive surgeon who possesses extensive knowledge of the nose, face and head. Dr. Azizzadeh has dual certification in head and neck surgery and facial plastic and reconstructive surgery. He takes a holistic approach to revision rhinoplasty procedures, and by doing so, helps patients address both cosmetic and functional nasal problems. What type of anesthesia is used during a revision rhinoplasty? Revision rhinoplasty is typically performed under general anesthesia. How is a revision rhinoplasty performed? Revision rhinoplasty is a very customized procedure, as the problem that is trying to be fixed is different for every patient. In general, during a revision rhinoplasty procedure, a patient first receives general anesthesia. Next, Dr. Azizzadeh makes incisions and separates the skin of the nose from underlying bone and cartilage. At this point, Dr. Azizzadeh may reposition cartilage, replace missing nasal structures in the nose or do whatever needs to be done to improve the form and function of the nose. Finally, Dr. Azizzadeh pulls the skin back down and closes the incisions. How long does it take to complete a revision rhinoplasty? Revision rhinoplasty surgery usually requires between one and two hours to complete. Before a revision rhinoplasty, Dr. Azizzadeh outlines all treatment stages. This helps a patient establish realistic expectations and plan accordingly based on the estimated time required to complete a revision rhinoplasty procedure. Will a revision rhinoplasty cause scars? If Dr. Azizzadeh performs a closed revision nose surgery, the incisions are confined to the nose. In this instance, no visible scarring will appear following surgery. Comparatively, if Dr. Azizzadeh conducts an open revision rhinoplasty procedure, minimal scarring may occur. During this procedure, Dr. Azizzadeh makes a small incision under the tip of the nose. This may result in a small scar that is virtually invisible. Dr. Azizzadeh performs a full patient evaluation prior to a revision rhinoplasty procedure. He then recommends an open or closed procedure based on the patient, his or her treatment goals and other factors. Additionally, Dr. Azizzadeh does everything possible to minimize the risk of revision rhinoplasty complications. He works diligently to make precise incisions and ensure each patient receives the best care. As such, Dr. Azizzadeh helps limit the risk of scarring and other revision rhinoplasty surgery complications. The surgery itself is not painful because the patient is under anesthesia. After surgery, patients are prescribed pain medications so they are comfortable during their recovery. Can I drive myself home after a revision rhinoplasty surgery? Dr. Azizzadeh does not allow a patient to drive himself or herself home after a revision rhinoplasty procedure. Instead, a patient will need to find someone who can drive him or her home following surgery. When are stitches removed after a revision rhinoplasty procedure? Stitches are generally removed within about six to eight days of treatment. Stitches are usually absorbed by the skin. Therefore, Dr. Azizzadeh may trim the stitches, which will not result in any pain. For those who are not satisfied with the results of a primary rhinoplasty, Dr. Azizzadeh can help. Dr. Azizzadeh is an internationally acclaimed facial plastic and reconstructive surgeon who has performed many successful revision rhinoplasty procedures in California. He helps revision rhinoplasty patients address nasal deformities, breathing difficulties and other problems caused by previous nose surgeries. Dr. Azizzadeh also customizes each revision rhinoplasty to his patient, enabling an individual to achieve a nose that perfectly complements his or her facial features. Dr. Azizzadeh is available to teach individuals about revision rhinoplasty. To learn more about revision rhinoplasty, please schedule a consultation with Dr. Azizzadeh at the CENTER for Advanced Facial Plastic Surgery in Beverly Hills or call (310) 657-2203. Unfortunately, not everyone has a stellar outcome with their first nose job! In some cases, a revision nose job, also known as revision rhinoplasty has to be considered, which requires a consultation with a revision rhinoplasty specialist. You may think you already know what the healing process will be like after rhinoplasty revision, but you must remember that revision rhinoplasty can be incredibly complex, as can be its recovery. By this time, you will have undertaken at least one nose surgery, and a revision nose job translates into prolonged healing (up to 2 years), even with the best rhinoplasty revision surgeon. You have made the difficult decision to undergo a revision nose job, which is one of the most technically challenging cosmetic procedures performed by a revision rhinoplasty specialist. What about your recovery? First off, you should expect pain, swelling, and bruising as well as stitches and a nose cast. At the end of the first week after your revision rhinoplasty, your cast and stitches will be removed. Approximately a month after your rhinoplasty revision, you should be able to return to normal activities, including exercise. Although you are ready for your reveal to friends and family, it can up to 2 years for your revision nose job to be totally devoid of swelling, making patience a key aspect of your recovery from revision rhinoplasty. Unfortunately, some men are disappointed by their results after undergoing an initial nose job. What are your options after a “botched” nose job? You can settle or you can find the best rhinoplasty revision surgeon to restore proper form and/or function to the most noticeable aspect of your face via a revision nose job. As of late, not only primary rhinoplasty but also revision rhinoplasty have been enjoying a swell of popularity among males. You should not be afraid to pursue male rhinoplasty revision. So go ahead and contact your revision rhinoplasty specialist today to improve your appearance and provide a boost of self-confidence. Rhinoplasty is one of the most popular cosmetic and facial procedures in the world. As a result, it can lead to revision rhinoplasty surgeries, especially in individuals disappointed with their outcome. A revision nose job performed by an experienced revision rhinoplasty specialist is an opportunity to not only restore balance and symmetry to your face but also correct nasal function. After outpatient rhinoplasty revision, you begin the recovery process. Seven days later, your nose cast/splint is removed. During this time period after your revision rhinoplasty, pain, swelling, and bruising will improve tremendously. Your friends and family will be amazed by your revision rhinoplasty before and after journey, which will take a total of 1 to 2 years. Imagine going through the deeply personal decision to undergo primary rhinoplasty, only to be devastated by unsatisfactory results. You are not alone, but your disappointment can be replaced by triumph with revision rhinoplasty. Your revision nose job should be done by an experienced revision rhinoplasty specialist who is schooled in the complexities of this technically demanding surgery. Remember, it is not recommended to pursue rhinoplasty revision until waiting 1 to 2 years after your initial nose job, which will give you plenty of time to find the best rhinoplasty revision surgeon in or out of your area. What Are the Risks Associated with Revision Rhinoplasty Surgery? Much like a primary rhinoplasty, there are risks associated with a revision nose surgery. Common revision rhinoplasty surgery risks include temporary loss of smell, breathing issues and infection. At the CENTER for Advanced Facial Plastic Surgery, Dr. Azizzadeh explains the risks associated with revision rhinoplasty before treatment. He also does everything possible to minimize revision rhinoplasty surgery complications. As a result, Dr. Azizzadeh frequently helps revision rhinoplasty patients alleviate surgery risks and achieve their desired treatment results. Is an Open or Closed Revision Rhinoplasty Right for You? Dr. Azizzadeh performs two types of rhinoplasty procedures: open and closed nose surgeries. Whereas an open rhinoplasty involves creating a small bridge incision to connect incisions to a patient’s left and right nostrils, a closed nose surgery involves modifications performed inside of a patient’s nostrils. When it comes to revision rhinoplasty, Dr. Azizzadeh allocates significant time and resources to analyze a patient and his or her treatment goals. He then offers a personalized treatment recommendation and explains whether a patient can benefit from an open or closed revision rhinoplasty procedure. Evaluating a revision rhinoplasty surgeon is rarely simple. Fortunately, there are several factors than an individual can consider to differentiate an exceptional revision rhinoplasty surgeon from an average one. Some of the factors to evaluate relative to a revision nose job surgeon include board certification, communication skills and the ability to deliver personalized care. Dr. Azizzadeh is a globally recognized facial plastic and reconstructive surgeon who has built his reputation on providing patients with the best-possible treatments. He is happy to meet with a patient, provide him or her with details about revision rhinoplasty surgery and help this individual achieve a balanced and natural-looking nose.